The main screen, showing the Studio soundset selected and the Pentamorph pointing to the Original samples. This fastidiously sampled instrument could be the only Rhodes you’ll ever need. 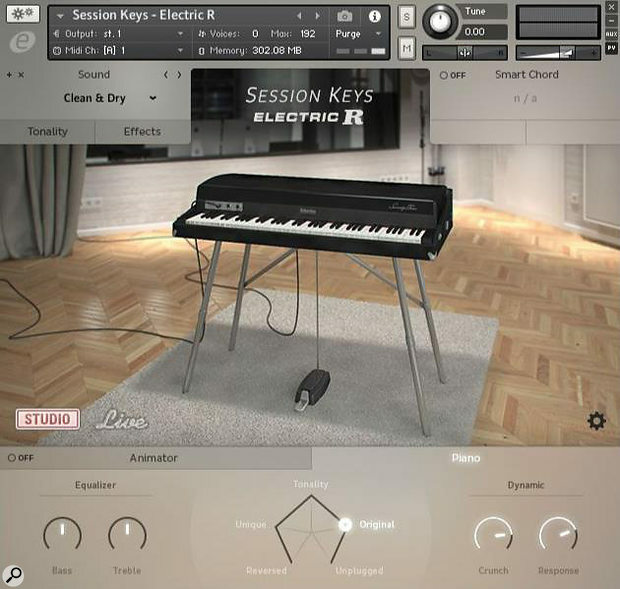 The Rhodes electric piano has been the subject of numerous virtual recreations, so does the world need yet another sampled offering? In short, yes. Having played many examples of the real thing over the years (and owned one absolute cracker), I can testify that no two sound quite the same, or respond to the player in the same way. There are so many variables in the way they can be adjusted, customised and otherwise interfered with, that every one has its own distinct personality. 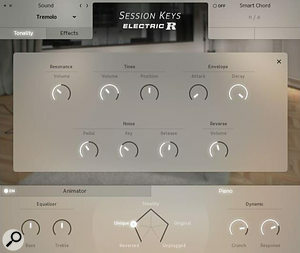 Session Keys Electric R is e-instruments’ worthwhile take on the subject, as part of their Session Keys series of Kontakt instruments. The piano sampled for Electric R is a specially modified MkI from 1976. As you’d expect, sampling was done in great detail, including plenty of mechanical minutiae: pedal noises, release noises — even the sound of keys bottoming out on the keybed. However, Electric R is more than just a straightforward clone. Two different soundsets are available, selectable with a single mouse click; the Studio soundset is the unprocessed, DI’d signal, whilst the Live soundset has been processed to represent the Rhodes in a miked-up, stage environment. The Studio set sounds more open, with a slightly throaty quality, whilst the Live set has less top end and more mid-range, with a slightly ‘boxier’ tone that nevertheless manages not to descend into mushiness. Looking for ways to expand the instrument’s possibilities, e-instruments also recorded the acoustic sound of the Rhodes (they make a surprisingly substantial sound even when unplugged) as well as providing reversed samples. Detailed settings are accessed via the Tonality tab, with further treatments from the in-built Effects, both discussed later. Central to Electric R’s Piano tab is the Pentamorph, an intriguing and stylish way to mix and morph between the various sample layers. Each of its five nodes represents a sample layer, or combination of layers. Clicking on the name at each node snaps directly there, but alternatively you can move the mouse up and down, and the ‘puck’ travels around the pentagon, morphing between adjacent positions. This movement, like all the continuous controls in Electric R, can also be assigned to any MIDI controller. The various nodes provide the following combinations: Unplugged = acoustic samples only; Original = the natural Rhodes samples; Tonality = the natural samples plus optional reversed and acoustic samples; Unique = a combination of acoustic and reversed samples; Reversed = reversed samples only. 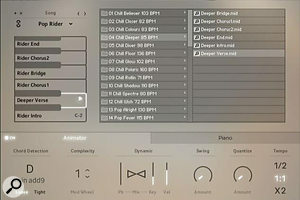 Staying on the Piano tab, the Equaliser offers Bass and Treble boost/cut; the two Dynamics controls provide a very effective means to customise the piano’s playing response. Crunch restricts (or gives) access to the highest velocity layers — set fully clockwise this provides a seriously aggressive character. Combined with a generous helping of key noise samples, this can sound very close to the Dyno-My-Piano modification popular in the 1970s. If a sweeter tone is required, just back off the Crunch level. The Response control adjusts volume dynamics from the full zero-to-127 range to no dynamics at all, whilst still playing through all the velocity layers as set by the Crunch control. Low Response settings are a useful alternative to compression if you simply want to keep the perceived volume fairly even. The Animator screen. The song Pop Rider is selected, a D-minor 9th chord is playing, and the verse phrase has just been replaced with the one highlighted in the browser on the right.The Tonality tab is essentially a mixer for the various sample elements, together with an AD (attack and decay) envelope shaper. The elements include Resonance (a subtle harmonic resonance effect applied when the sustain pedal is down), Tine Position (see Box: Tine For A Change), plus Pedal, Key and Release noises. Tine Volume and Reverse Volume have no effect while the Pentamorph is at the Original node position, but do gradually take effect as you morph towards the Tonality node. Both the Unique and Reverse Pentamorph nodes can have dramatically different Tonality settings, enabling some extreme sound-morphing as you move the Pentamorph’s puck anticlockwise from the 12 o’clock position. This all sounds potentially complicated in print, but it’s blindingly obvious in practice! Thirty factory preset patches show what Electric R can do, from the straight-up to the downright weird — and you can save your own, too. User presets remember all Tonality and Effect settings, but not the choice of Studio or Live soundset. Under general settings there are options for overall tuning, equal temperament or stretch tuning, and velocity curve. The optional Silent Key function is a nicely observed touch of realism — key velocities of five or less make no sound, mimicking real Rhodes behaviour, where very lightly played keys would impart insufficient force to make the hammer strike the tine. Seven of Kontakt’s in-built effects, daisy-chained in series, add icing to the cake. The order of effects is sensibly chosen: Tremolo, Chorus, Phaser, Amp, Compressor, Delay and Convolution Reverb. The Tremolo is worthy of mention, incorporating both tremolo and autopan in the one module. The speed of each can be set independently, with a fader to control the balance between the two. The modulation waveform is smoothly variable from sine, through triangle, to square. The various sample elements are mixed in the Tonality screen. 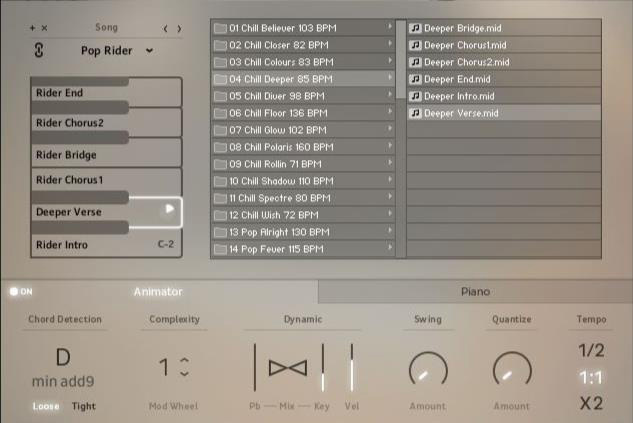 Their values can be changed significantly by moving around the Pentamorph.Anyone acquainted with e-instruments’ Session Strings and Session Brass instruments will be familiar with their Animator concept — a tempo-sync’ed auto-accompaniment tool based around a library of MIDI files. These are arranged as 40 preset Songs in an assortment of musical genres, each comprising seven keyswitchable phrases (intro, verse, chorus, etc). Simply play the right chords, and the Chord Detection does the rest, even recognising different chord inversions. Each phrase has three levels of complexity, controllable via the mod wheel. The phrases’ dynamics are controlled either by key velocity, or in real time via the pitch wheel, or a combination of both. The browser on the right accesses the phrase folders for all the songs, so you can construct your own songs simply by clicking the GUI key of the phrase you wish to replace, then double-clicking in the browser on the phrase you want to replace it with. Also included are controls for Swing and Quantise amounts, and a tempo divider for normal, half-speed or double-speed playback. Electric R has a voice all of its own: gruff and throaty in the mid to lower range, yet clear and delicate in the upper registers. Like any two examples of the real thing, it sits perfectly in some tracks, yet can also sound slightly out of place in others. If any practical criticism is to be made, it would concern a handful of notes that sound choked, notably the E (64), F (65), B (59) and C (60), at around velocity 112 (measured with Crunch at its default setting). That said, Electric R is enjoyable and satisfying to play, and offers some unusual sonic twists. Definitely one to investigate if you’re after an authentic Rhodes experience, and well worth considering as a foil to other Rhodes software you might own. Two obvious contenders that come to mind are Scarbee’s Mk1 and SonicCouture’s EP73 Deconstructed, both Kontakt-hosted instruments. Scarbee’s instrument is the least feature-laden, relying only on Kontakt’s effects for added spice. EP73 Deconstructed ventures into wilder territory, with bowed, plucked and mallet samples, and some clever KSP scripting. The PDF manual contains some misinformation, which whilst not crucial to enjoying the instrument, makes for slight confusion in what a couple of controls actually do. The manual refers to the complete tine/tonebar assembly in a real Rhodes as the ‘tine’ — its proper name should be the ‘tone generator assembly’. The tine is the thin, flexible lower rod struck by the hammer, contributing to the piano’s bright, bell-like character; the heavy upper part that provides the body and sustain is the tonebar. Pure semantics, you might say. However, the Tonality control for ‘tine volume’, which ordinarily might be expected to add brightness to the sound, in fact controls the volume of the acoustically recorded samples. The other misnomer is the statement that the harmonic colour (ie. the amount of second harmonic that produces the ‘octave above’ character) is determined by the tines’ proximity to the pickups. The proximity actually affects the dynamic response, not the second harmonic. Closer proximity makes for a more ‘barking’ tone; it’s the angle of the tines relative to the centre of the pickups that affects the second harmonic. So the Position control should be thought of as ‘Angle’, whilst the Crunch control in the Dynamics section is arguably more closely analogous to the pickup proximity. Highly detailed and very playable recreation of a Rhodes. Acoustic and reversed samples plus morphing control add extra sonic interest. A few notes sound choked at velocity 112. 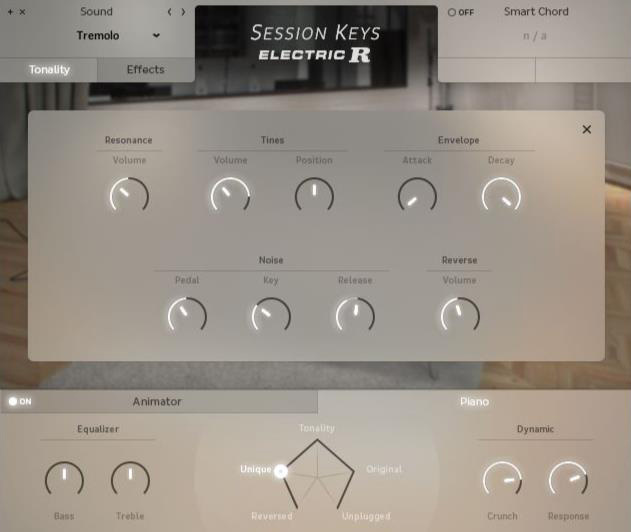 In a market already well populated by Rhodes clones, Electric R holds its own with its meticulously detailed samples, individual sonic twists, characterful tone and good playability.